For the first time, we invite visitors to join a Behind the Scenes guided tour of the Queensland Museum textile collection with a focus on costume, underwear and Queensland fashion. 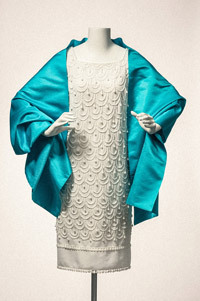 The textile collection covers a diverse range of objects, each with their unique story about fashion and clothing in Queensland. The tour will focus on objects in our Western Dress Collection which spans from c.1775 to 2009. Signature pieces include a Sack Dress (Robe à la Francaise) from the late 18th Century, an 1892 ball gown designed by Mrs Janet Walker, dresses designed by Gwen Gillam, corsets and underwear from the Jenyns Patent Corset Company and Berlei, and a 2009 black silk evening dress designed by Darb Couture. This guided tour takes you behind the scenes for a unique chance to see part of the Queensland Museum collection up close and learn more about how we store and look after these precious objects. Visitors attending this tour will also receive FREE entry into Undressed: 350 years of underwear in fashion on the same day as this tour (on presentation of this Behind the Scenes ticket). Cost: $45 Adults, $40 Concession, $15 Child (10-15). Children must be 10 years and over. MyMuseum Adult* $40.50, MyMuseum Concession* $36. *MyMuseum membership card must be presented on arrival. Numbers are limited. Bookings are essential. Tickets: BOOK NOW online or phone QTIX on 136 246.